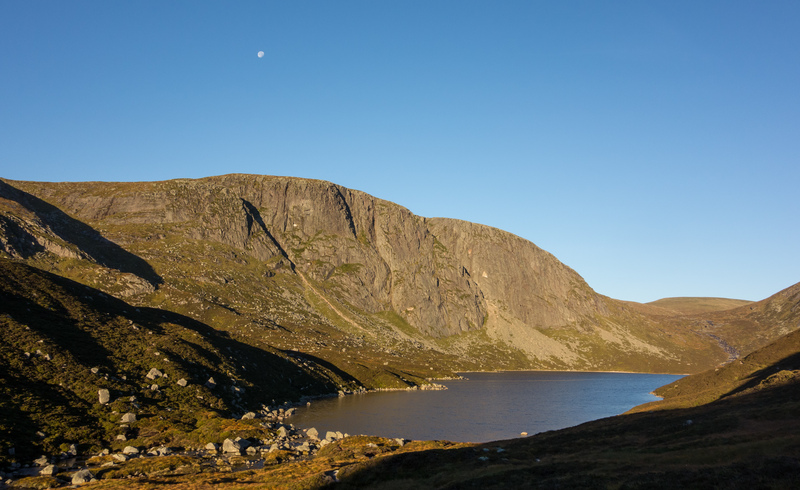 There can’t be many October days when it’s possible to climb a route on the Dubh Loch in t-shirts, but during last week’s heat wave we were lucky enough to get the chance! 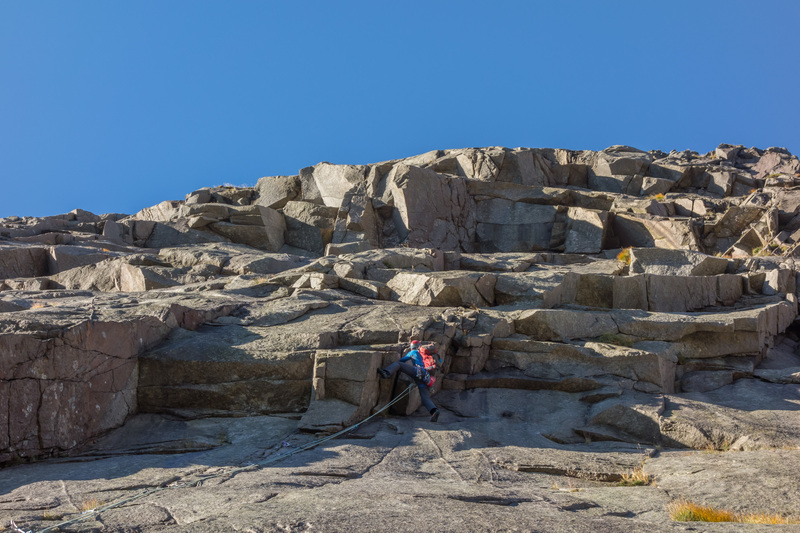 Booking Thursday off work, we reasoned that five days of warm sunny weather must surely be enough to dry out the notoriously damp Central Slabs and give us a shot at one of our bucket-list routes – Cyclops. 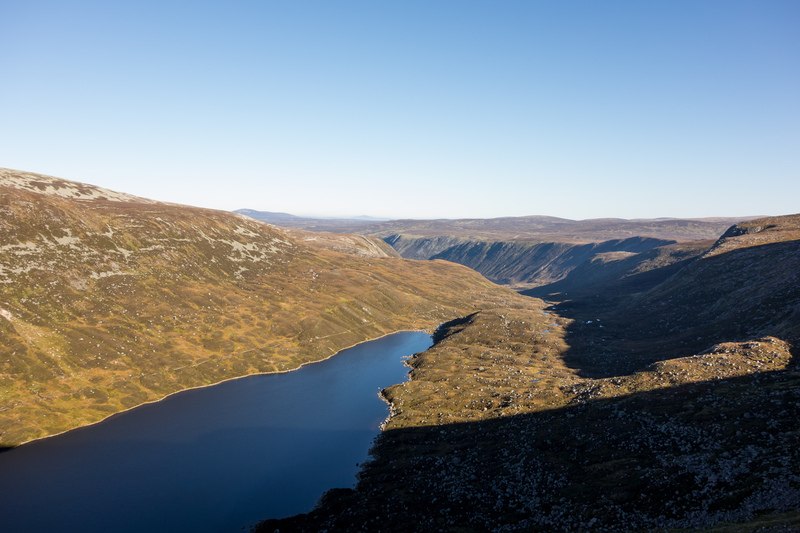 A flat car battery stalled the early getaway but a thirty minute cycle along Loch Muick and an hour’s frog-march up the path brought us to the base of the route before 9 am. Despite our lack of mileage on rock over the summer, we wanted to capitalise on recent productive trips to the Alps and Fontainebleau where we had regained a small amount of form. That said, psyched as I was, nerves were running high and I was genuinely uncertain about the outcome. I hoped we would be good enough. The ten pitch route is graded HVS, but with no pitches easier than VS and two famous cruxes, it feels very sustained. The option to scamper off the mid-way terraces reduces the commitment somewhat, but we had no intention of that, it was all or nothing! A seemingly never-ending maze of slabs, cracks and overlapping perfection! 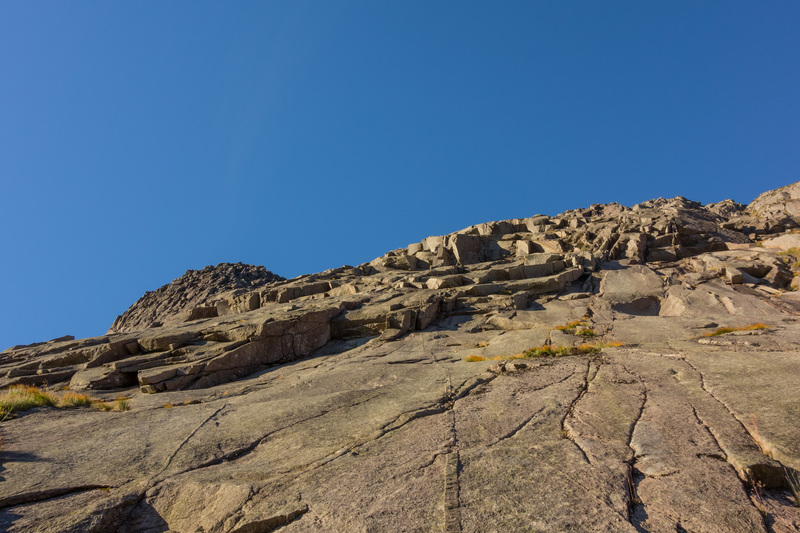 With a deep breath I set off up the first 5a pitch – steady cracked slabs with good runners led me to a slight steepening of the angle and a flaring of the cracks. Faced with insecure and apparently bold climbing above, progress slowed dramatically. After repeated tentative probing my calves were burning and I knew I had no choice but to get on with it. As is so often the case, it was fine, gear magically appeared where needed and I arrived happily at the overlap. A few stiff pulls later and I was on the belay ledge. Now well behind schedule already, it was down to Debs to make up some time! 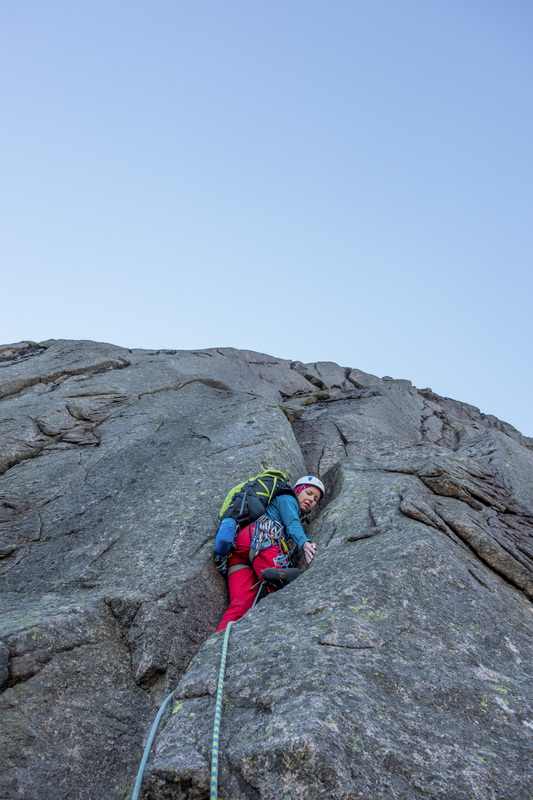 She raced up the perfect cracks above to belay below the main overhangs and promptly look the reigns for pitch three as well – rapidly bringing us back on track, if a little off route. By the time we realised our mistake I had climbed a pitch a few metres to the right of Cyclops, likely doing pitch 4 of Black Mamba, thus requiring a bonus linkage pitch to get us back on line. 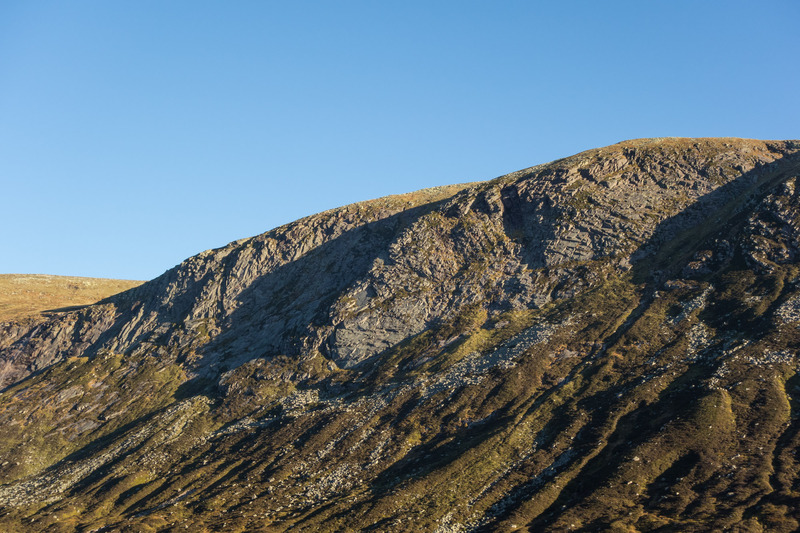 A slimy scramble across the terrace deposited us at the base of an awkward looking groove and the famous Crescent Groove above. The awkward groove is considered the technical crux and I cannot believe it’s only 5a! The climbing is technical, insecure and by the time you’ve desperately mantled out of the groove onto a sloping shelf, bold as well. A truly heroic lead from Debs and a section of climbing I was all too happy to enjoy from the blunt ends of the rope! 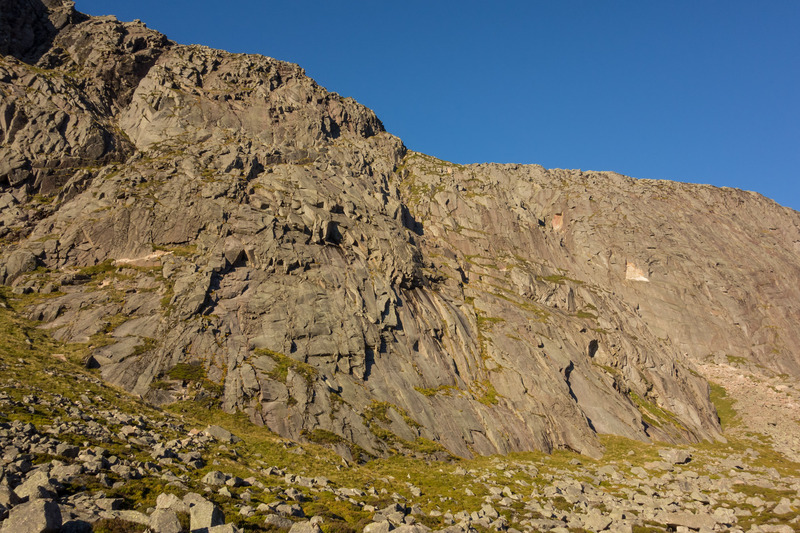 A tricky pitch of damp rounded cracks led to the base of one of the highlights of the route – the Quartz Corner. 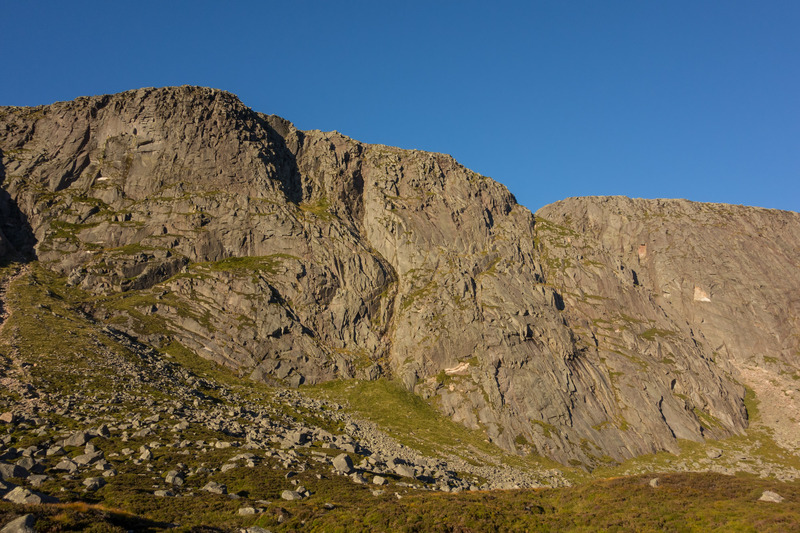 Weathering of the pegmatite vein has resulted in perfect positive holds which are climbed steeply to attain an outrageous position on the rib above, with 250m of cliff plunging away beneath your heels. A moment to savour! 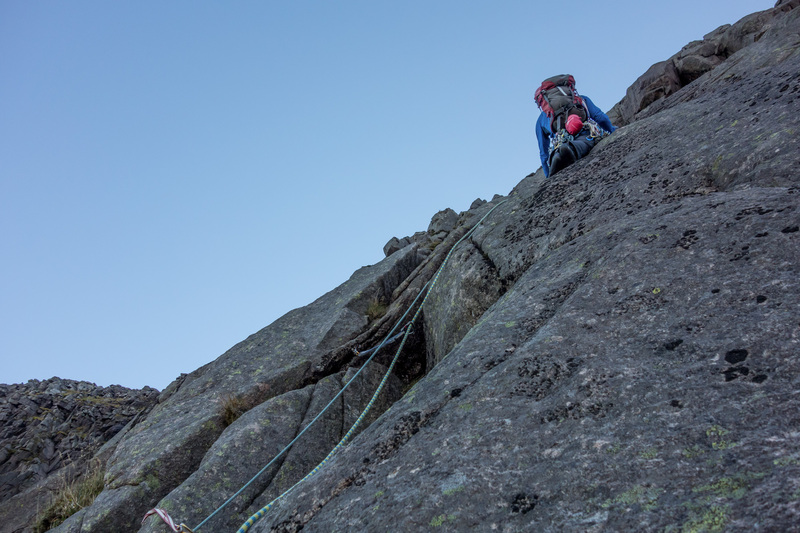 Questing upwards towards the Quartz Corner – only three more pitches to go! The final exit pitch was all a bit sketchy as thanks to the roll-top nature of the cliff the final 50m becomes less steep and quite vegetated. The grooves and slabs were covered in slime and a paucity of protection made me thankful the climbing wasn’t too difficult. A belly-flop on to a muddy ledge signalled the end of the difficulties and the Dubh Loch echoed to the sounds of cheering as Debs joined me on top. 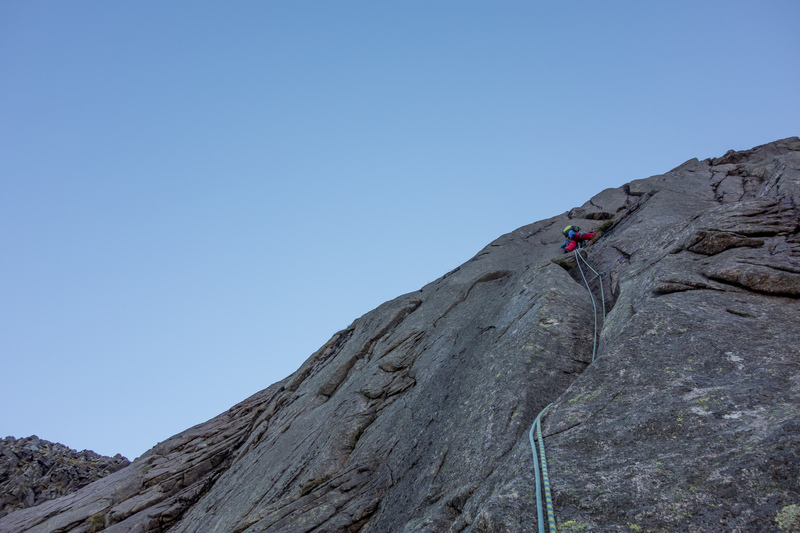 So we end this summer’s climbing with lots of adjectives – the final route of the season was the longest, hardest and most uncertain, but because of this, also the best!